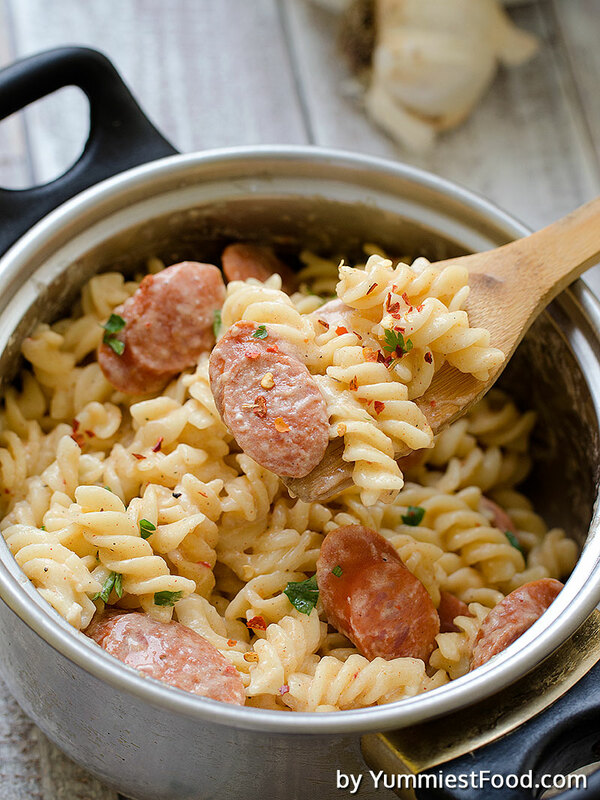 I am sure you will love this easy, delicious rotini pasta with sausages and garlic sauce, which is my favorite! 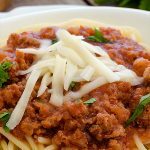 Easy and quick sauce, which is my favorite dish, and I hope it will become yours, too. I usually cook it for dinner and it can be done for 15minutes if you have all ingredients. 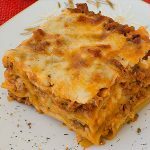 My children love this dish very much and I cook it very often in my kitchen. 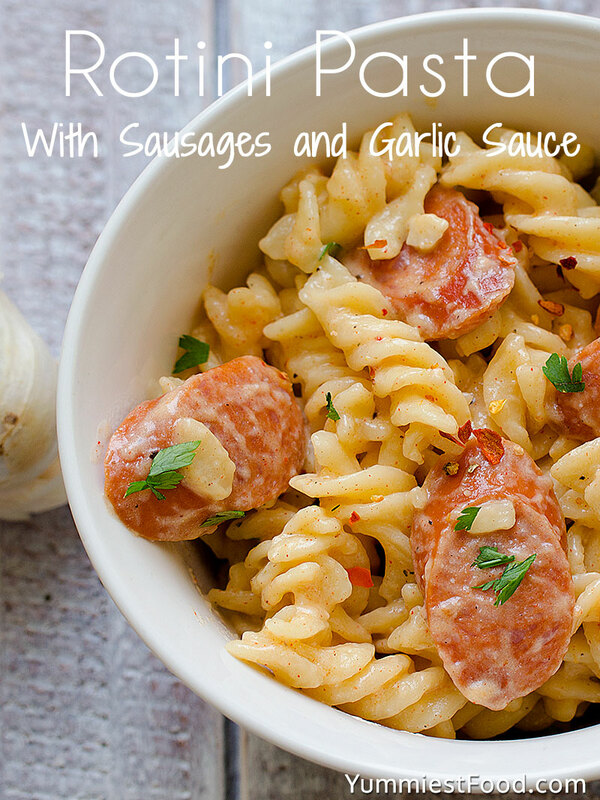 My daughter like sausages, my son like garlic sauce and this combination is a real hit when they are hungry! 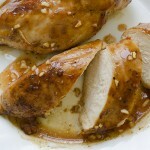 So easy, quick and so delicious! 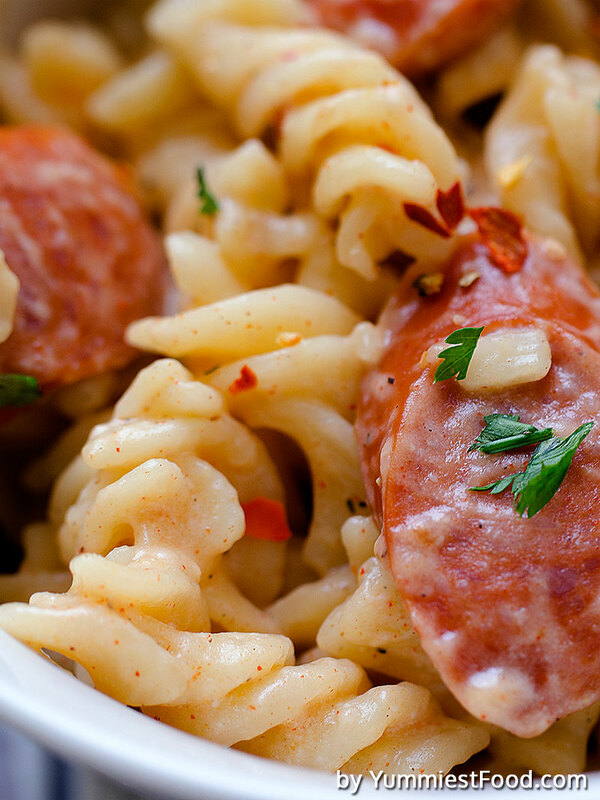 You must try to make my Rotini pasta with sausages and garlic sauce! This sauce is very mild and the smell of garlic and smoked sausages is everything that we need. 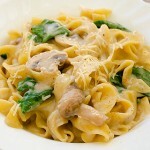 In large pot of water for rotini pasta add ½ teaspoon salt, and leave until boiling. Heat olive oil in large skillet over medium heat, add sausages and roast them on both sides for 3 minutes; set aside. In same skillet add garlic stirring frequently 1 minute and whisk in flour until lightly browned, then whisk in chicken broth and cook about 5-6 minutes. Stir in sweet cream, add salt and pepper to taste. Meanwhile, cook rotini pasta according to package instructions; drain well. In sauce, stir in pasta and sausages until well combined.